Perched on the mountainside overlooking the Columbia Wetlands and Columbia River Valley lies the spectacular Columbia Wetlands Outpost Lodge. 6 bedrooms are available in the Lodge which can sleep up to 14 people comfortably. With sweeping views from the cosy living rooms and an inviting open concept kitchen/dining area, it is the ideal spot to gather and relive the days’ adventures. Spacious and welcoming open concept kitchen and dining room with woodburning stove, open onto a beautiful patio and garden with hot tub for 8 people. The kitchen is well equipped with all the appliances for a comfortable stay – large fridge/freezer, dishwasher, oven/cook top, microwave, coffee maker, and for the kids a movie theatre style popcorn maker. 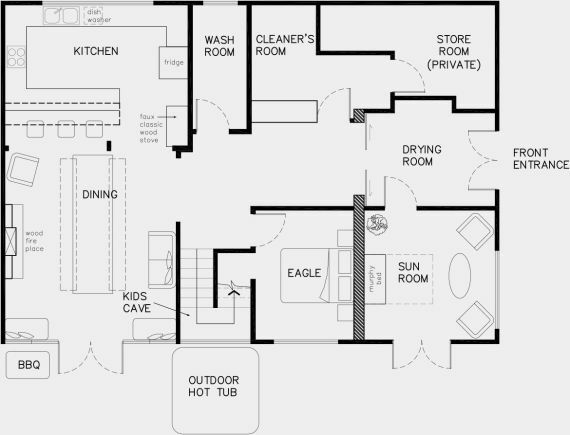 1 well appointed bedroom and a sunroom are on this level and make good choices for those with limited mobility. Sun Room a sunny sitting area with an optional queen murphy bed, and a door leading onto the patio. Eagle Room with a queen bed and ample closet space. The main floor bathroom has under-floor heating and a beautifully tiled, easy access shower . The light and airy living room has a magnificent view over the Columbia Wetlands. It has an electric fireplace, flat screen TV and plenty of games to while away the evenings. There are 4 spacious and well appointed bedrooms upstairs, 3 of which Elk, Moose, and Bear have twin beds that can be converted into a king bed as requested. 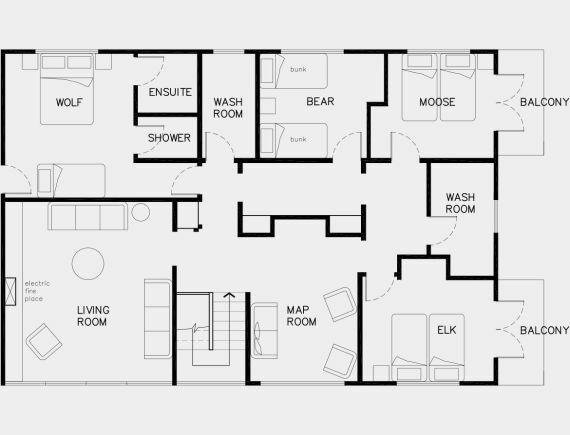 The Elk and Moose bedrooms both have balconies with views of the forest and river. The fourth bedroom Wolf family bedroom has both queen and bunk beds, as well as an en-suite. Shuttle Service: With advance booking, a 15 passenger van is available to transport guests for a night out. Rates are $90/hour.